Skip the frying and make Skinny Fried Chicken fingers from David Venable's newest cook book, Back Around the Kitchen Table. 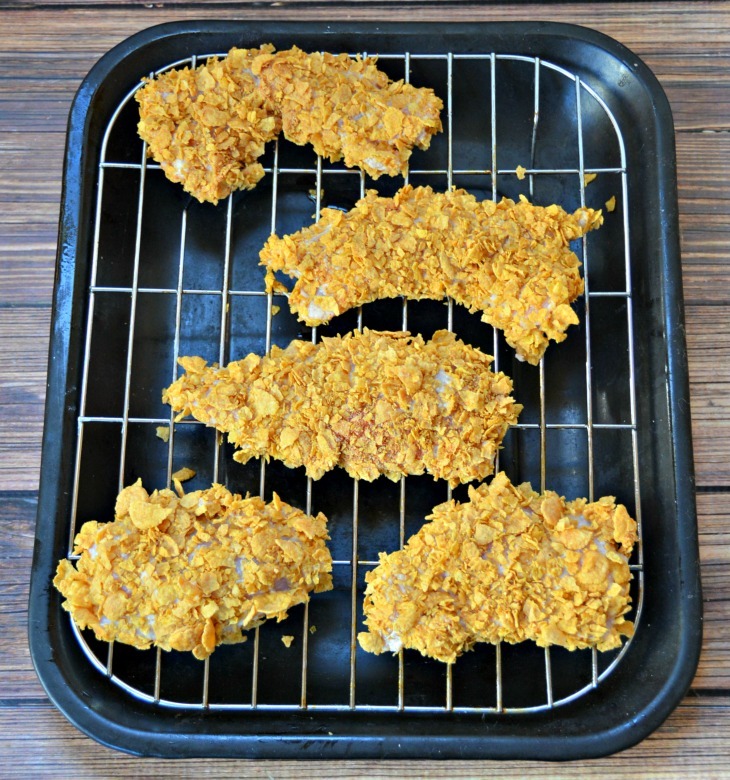 Chicken breasts are breaded in corn flakes and baked for a crunchy chicken finger the kids will love. I love to cook. I suppose that's pretty obvious if you are around here much. I share a lot of recipes because I spend a lot of time in my kitchen. I also have a deep love for cook books. While you can pretty much find any recipe you want on the internet, I still love to sit down and spend an hour looking through a cook book. The latest addition to my ever cook book collection is David Venable's Back Around the Kitchen Table from QVC. I know I have a great cook book in my hand when I end up dog earring page after page. Back Around the Kitchen Table is full of delicious comfort food recipes. David is the host of In the Kitchen with David® on QVC and this is his 2nd cook book. Within a week of owning Back Around the Kitchen Table, I'd already made two recipes. We tried out a slow cooker Guinness Beef Stew for a Sunday dinner after a busy day of activities and it was amazing. 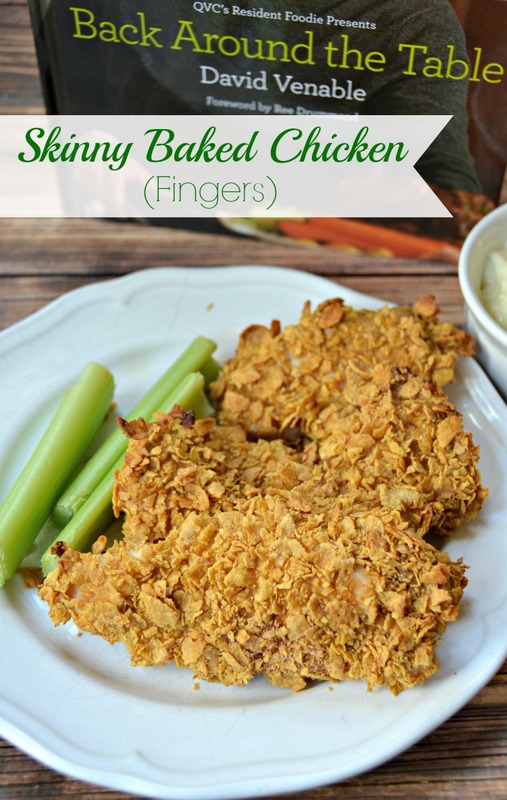 Next we tried this Skinny Fried Chicken for a weeknight meal. This recipe only requires 4 main ingredients and I knew my kids would love it. I'm terrible at following recipes and so I end up having to make adjustments as I go. This recipe is supposed to be for whole chicken breasts. But I missed the part that said to pound the chicken breasts before marinating. It was 10 pm at night and everyone else was asleep. So instead, I cut the breasts up and made chicken strips. I let the breasts sit overnight in the buttermilk marinade. 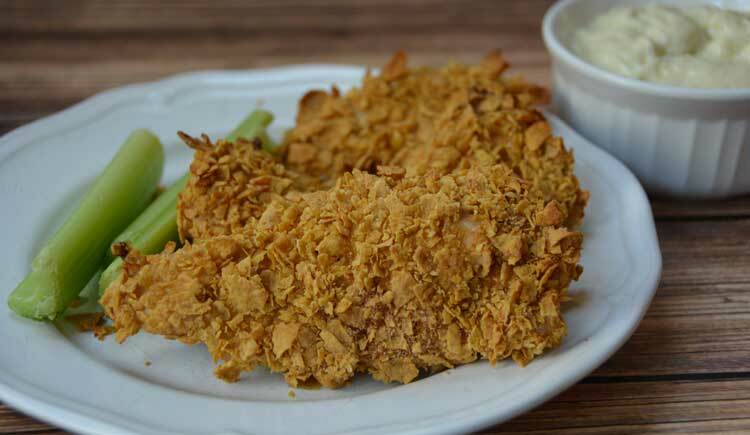 In a true fried chicken fashion, the chicken is double coated – once in flour and then again in crushed corn flakes. My mother-in-law introduced me to cooking with corn flake crumbs. 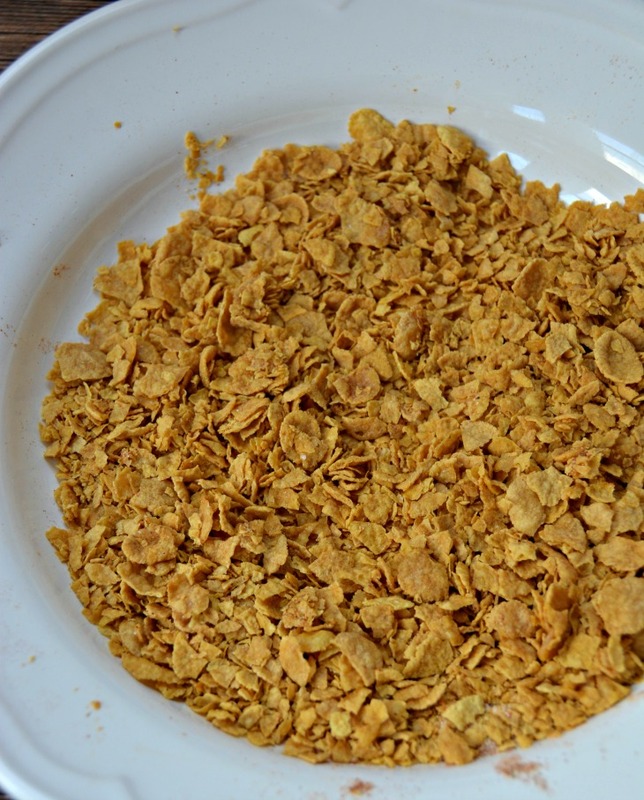 You can actually buy a container of the crumbs themselves or do as I did and just crush up cornflakes. After breading the chicken, you bake it on a wire rack at 400 degrees for 15 minutes to get the coating nice and crunchy and then lower the heat to continue cooking the meat. These are ready to eat in about 30 minutes. 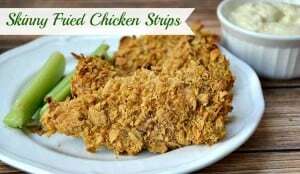 I served the skinny fried chicken fingers with celery and a side of ranch for dipping both the chicken and the veggies. They are super crunchy and everyone loved them. Mix buttermilk and hot sauce together and put in a resealable bag. Add the chicken and seal the bag. 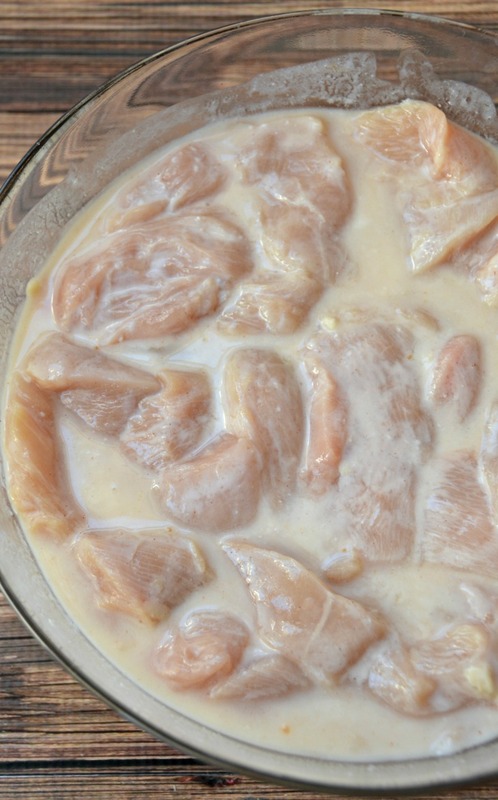 Shake to cover the chicken and all to marinate for at least 2 hours or overnight. Position a rack in the middle of the oven. Preheat oven to 400 degrees. Spray a wire rack with oil and place it in a roasting pan or on a baking sheet. Place the flour on a plate. Mix the corn flake crumbs with paprika, salt, pepper, garlic, onion, cayenne and poultry seasoning in a bowl until evenly distributed. Remove the chicken from the bag and place on a plate. Pour the marinade in to a medium bowl. Dredge each chicken finger with the flour until full coated, shaking off any excess. Then coat the chicken in the marinade, followed by a dredging in the corn flake mixture. Arrange the chicken pieces on the prepared wire rack. Bake for 10 (15 for whole breasts) minutes. Reduce oven temperature to 350 degrees and bake until cooked through and crispy, another 10-15 minutes (15-20 minutes for whole breasts). This is a half recipe from the cook book. You can double this and bake with whole chicken breasts pounded thin. David Venable's Back Around the Kitchen Table is the perfect gift for any novice, aspiring, or experienced cook on your list. It is packed full of easy recipes that everyone will love. Go get it at QVC! 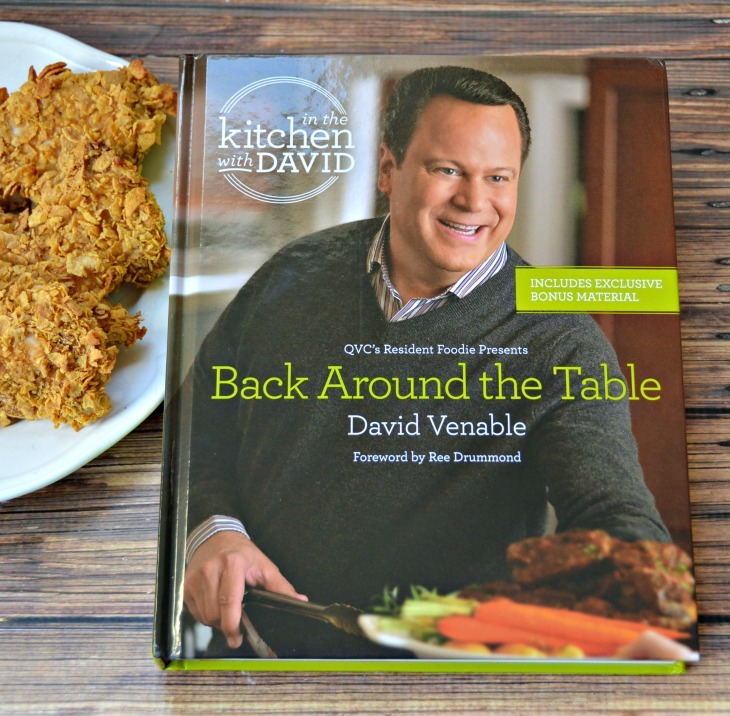 If you think your family will enjoy this recipe, be sure to visit qvc.co/AroundtheTableCookbook to learn more about and purchase Back Around the Table: An “In the Kitchen with David” Cookbook. Filled with 156 great recipes like this, you’re sure to find something that fits your lifestyle and gathers everyone back around the table! This is a sponsored conversation written by me on behalf of QVC. The opinions and text are all mine.